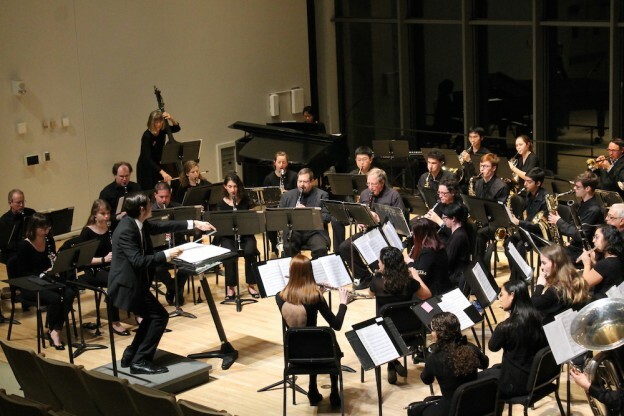 The Swarthmore College Wind Ensemble is holding its annual fall program on Saturday, November 17th at 8:00 pm, located at the Lang Concert Hall. The Wind Ensemble is a Tri-College group, welcoming student musicians from both Haverford College and Bryn Mawr College. The ensemble is directed by Professor Andrew Hauze ‘04. The repertoire for this concert will feature songs originating from different places around the world. The songs include Percy Grainger’s Irish Tune from County Derry and Shepherd’s Hey, Chen Yi’s Suite from China West, Frank Ticheli’s arrangement of Shenandoah, and Darius Milhaud’s classic Suite Française. When Hauze plans for each Wind Ensemble concert, he must take into consideration student enrichment, audience reception, and performance cohesiveness. “Each semester in Wind Ensemble, I try to pick pieces across a range of styles, moods, and technical challenges that will be enriching to work on for the whole semester, but also make a satisfying concert experience for the audience,” Hauze said. For this fall’s repertoire, Hauze put together an eclectic group of pieces that share a common origin in traditional folk music. Out of the repertoire, Hauze is excited to explore one specific piece due to its challenging nature. The decision to include Chen Yi’s Suite from China West is partly influenced by the big presence of traditional Chinese music on Swarthmore’s campus. Hauze attributes this presence to the Swarthmore College Chinese Music Ensemble, which is led by colleague Professor Lei Ouyang Bryant. This year’s Wind Ensemble is a bit larger than previous years, composed of thirty-nine members. Additionally, six professional musicians will be joining the student musicians during the concert. This entry was posted in Music on November 16, 2018 by dpulley1.